Attending school is one of the essential phases we need to go through in life. It has become a fact that the right to education should always be present in every individual no matter what gender or the color of the skin you possess. With that being accepted, you would observe parents working hard for their family and save enough money just to send their kids to school and encourage their kids to apply for a scholarship so that burden of the tuition would be scraped off a little bit. Along with this, they also try to encourage their child to study hard and to not get a failure in the final grades so that the scholarship would not be gone to waste. You may also see doctor excuse templates. But there are just cases that man cannot control and that is getting absent because of an unexpected event. If you can remember, there were classmates you had who were absent from time to time because of numerous reasons that they could not control. When they do come back from being sick, they would usually send a school excuse note. In this article, we will tell describe to you what an excuse note for school is. After that, we will tell you the parts of this excuse note. Lastly, we will be enumerating the ways on how you yourself can stay healthy and avoid being absent from school or if you are a parent, this will helping your son not to be absent in class. 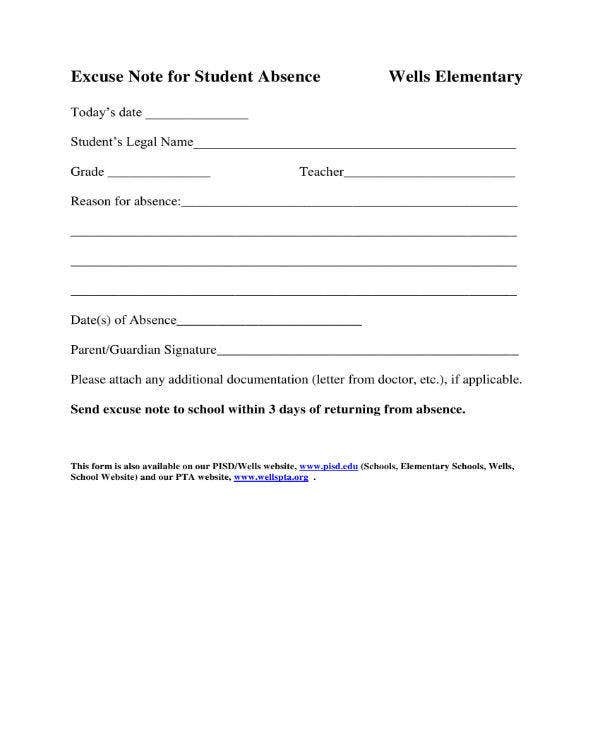 You may also see work & school excuse note templates. Let us now go to understanding the definition an excuse note for school. You do not have to worry about the definition because it is pretty simple and easy to understand that will not require you to take notes of it. You may also see sample doctor excuse notes. An excuse note from school in context has the same purpose as an excuse letter. 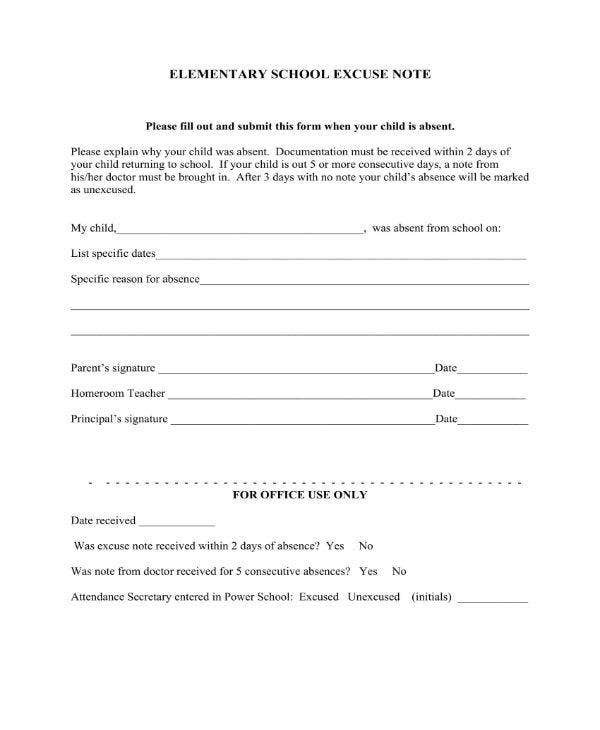 It is defined as a kind of document where one passes for the purpose of having the individual be excused for being absent from class and hopefully, the one who reads it would see it as valid and would understand the situation and grant them a special class after the person comes back from being absent. It is like a business letter because a note can also be a letter that is why it is the same as an excuse letter for school. You may also see best note templates. The reasons for being excused can vary from being sick or having a family vacation or occasion. The reader would decide if one is valid or not because some absences are just unnecessary and have no medical certificate to show for. An absence in class is an absence of knowledge especially if the reason for being absent is nowhere near being valid. Do not train your child to be lazy which would lead him to the act of being absent in a class because he does not want to learn. Discuss with him or her the importance of having the chance to be educated day in and day out. You may also see free note templates. 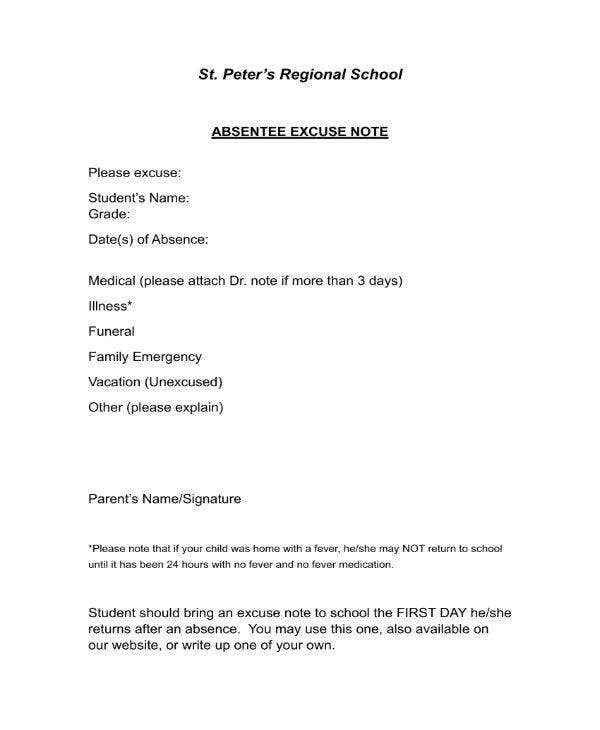 If you have fully understood the definition of an excuse note, let us now go in enumerating the parts of an excuse note for school if ever your child gets sick or have an important family matter which requires him or her to be absent from class. 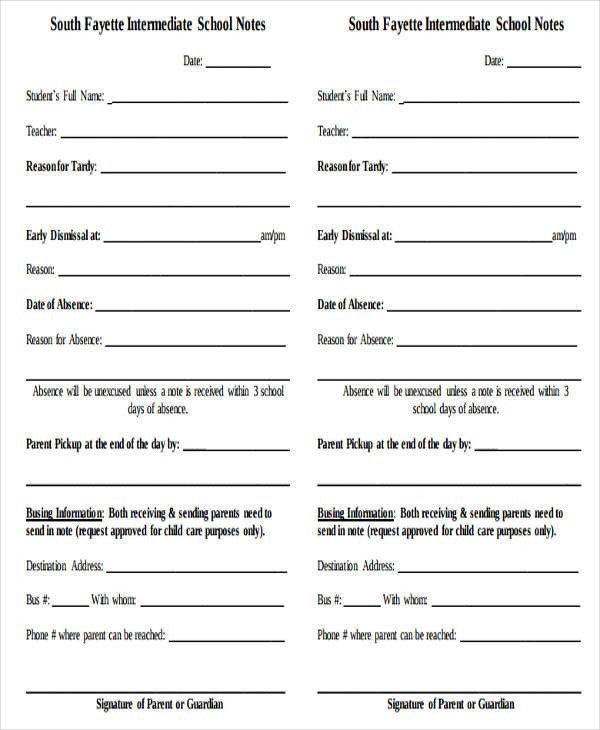 You would notice that the parts of an excuse note for school is the same as of an excuse letter and of any business letters that exist. But if you have not seen a business letter, this article will show you what are its parts through having an excuse note as the example. That is why we still encourage you to take note of the following as this will be useful in the future not just in school but for other aspects of your life that you need to be absent from for a while. You may also see release note templates. This is the very first part of the excuse note just like in the letter. You have to write the date of the targeted date you will send the excuse note to the teacher or principal. 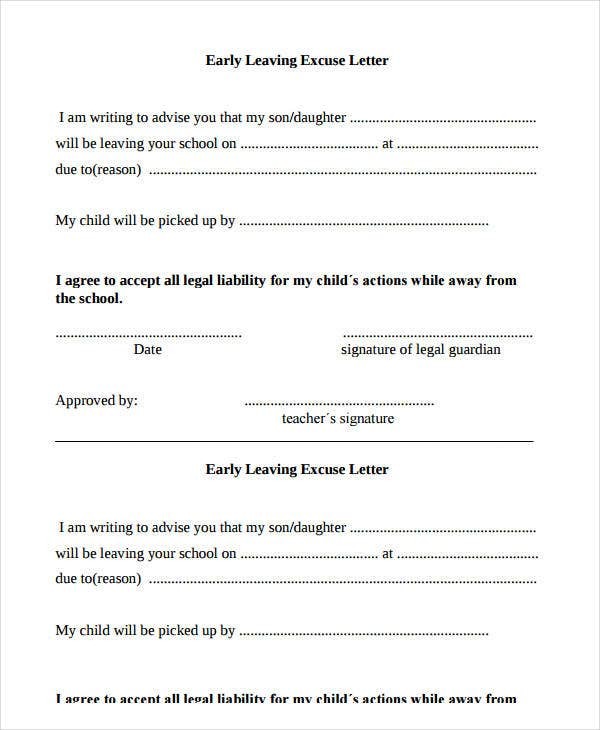 It is ideal that you would submit the letter during the day your son or daughter has to be absent from school. You may also see therapy note templates. In this part of the letter, you should write the full and complete name of the person you are sending the letter to, ideally the principal or the teacher. After you state the name of the receiver, you should state his or her position in the office or school. Identify if he or she is the principal or the adviser/teacher of your child. Next, you should write the full address of the school and make sure it is correct to avoid any conflict with the office staff in the school. You may also see note template samples. Whenever you try to have a conversation with someone, you always have to open it up with a greeting like a simple hello or a simple hi. Making an excuse note also has to have that kind of approach but in a way that is formal and professional. Below are some of the most commonly used greetings by employees around the globe. 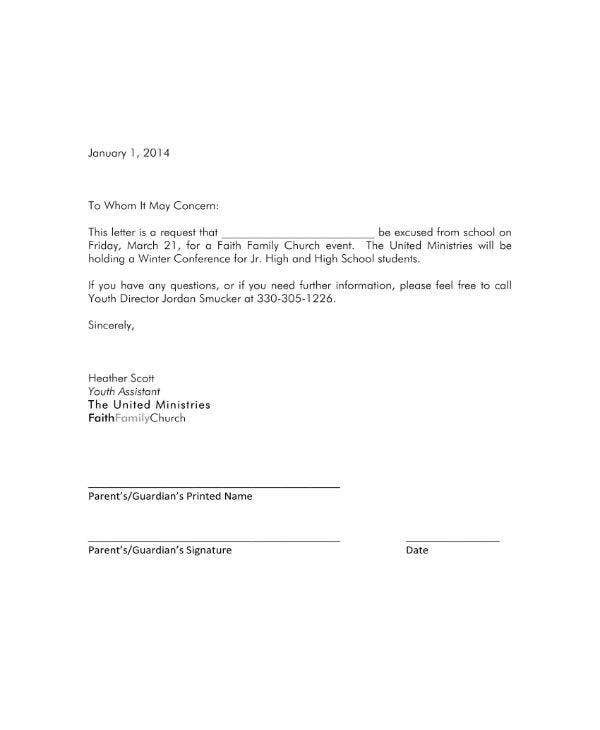 You may also see counseling note templates. 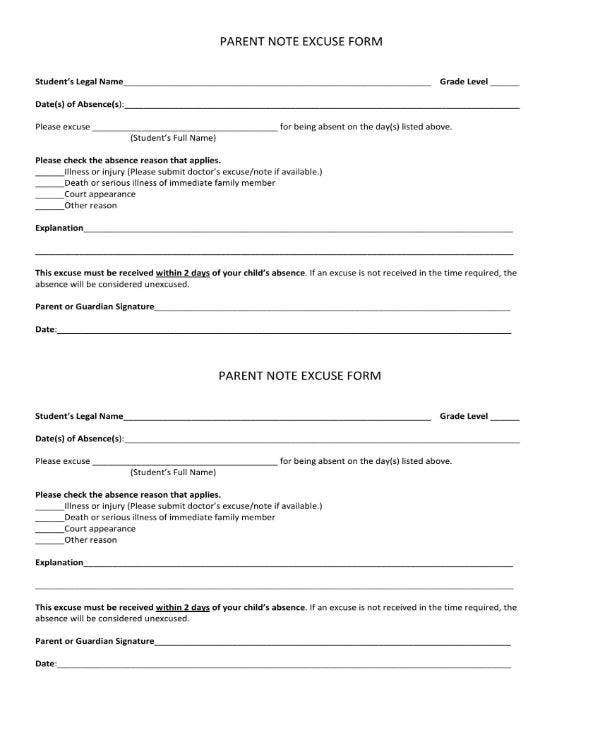 This part of the note or letter is where you would state the purpose of you sending this to the teacher or principal of the school where your child is currently studying at. In stating your purpose, do not waste your time in telling why you are writing this letter. State the reason for you sending the letter in the first sentences of the first paragraph of the note or letter. You do not have to waste the reader’s time in reading a complex and long letter but in the end, the purpose was just so simple. If the purpose is simple, make the content simple and straight to the point and do not make it so long. Do not shout out adjectives that would seem that you are looking for empathy because your child is absent. Make the note or letter as professional as a note or letter can be and just hope for the best. You may also see patient note templates. In this part of the letter or note, you will have to officially say goodbye to the receiver because the letter or note has ended. Just like saying goodbye, you have to also say or write it here. In doing so, you still have to make it sound and look professional as any note or letter can be. Again, you can search on the internet for more examples of a complimentary close. You may also see application note templates. By this part of the note, you have to affix your signature on your complete or full name. This for you to assure responsibility in everything written in the note or letter because if it turns out that your son or daughter was not actually sick and spotted somewhere else, you have to answer for that. Make sure, to be honest in everything you have written there especially if it involves your children. You may also see briefing note templates. Now that we have enumerated the parts of an excuse note, let us now go to the final part of this article. Seeing your child sick and absent from school is one of the saddest things you have to accept and handle as a parent. But you can see less of that if you know how to take care of your child. In this last part of the article, we will be enumerating tips on how you can avoid your child being absent from school and staying as healthy as possible. Remember that you also have a role to play as a parent for your child’s success in the future. We strongly suggest that you have to take note of these tips as these are very useful in life not only for your kids but also for you guys. You may also see study note templates. These are tips that can help a child stay healthy and look young as they are. An absent from class is an absence of a chance to actually learn something new in the class. 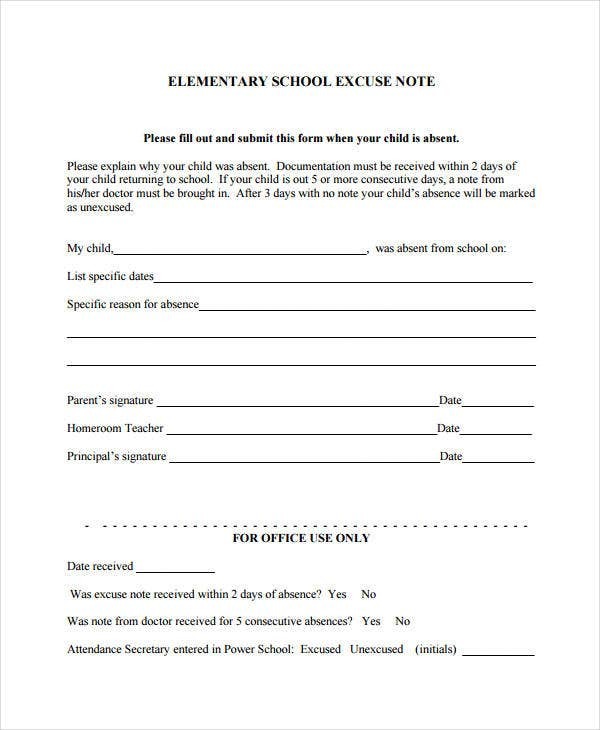 But if ever he or she does get absent, never forget to tell the teacher or principal the reason why through an excuse note or excuse letter. 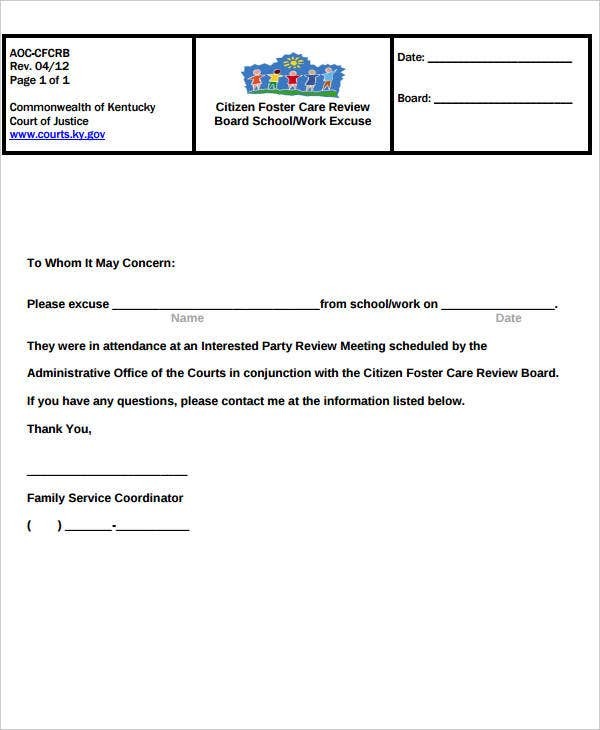 You may also see free doctors excuse note.